thanksgiving dinner this year was a german/european one. we started off with a tomato-goat cheese tart (a slight variation from the original which flo told me how to make it :)), followed by a baby spinach salad with yogurt dressing, grape tomatoes and roasted sunflower seeds. the main course was a pork filet with spaetzle, butter carrots and brussels sprouts. 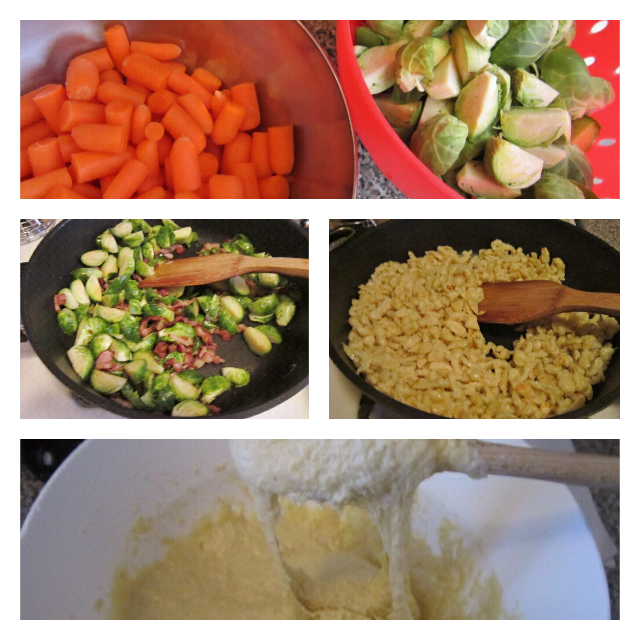 I added onions to the carrots and bacon to the sprouts. for the sauce, I used the juices of the meat, added some white wine, heavy cream and diced onions and mushrooms, a little flour to thicken it and just seasoned it to taste with salt and pepper. I think I added a bit of concentrated beef broth. and voila, a delicious sauce as easy as that. for the leftovers I made the almost exact same sauce, just without the meat juices and it still tasted just great. our dessert was a classic mousse au chocolat – not so pretty on a pic but very delicious. I melted two bars of dark trader joe’s chocolate, four eggs, mix the yolks with some sugar (I think I used 1/4 cup) and add 3 tablespoons of rum (any other alcohol works fine, too or just use warm water instead). add the melted chocolate and mix it into a heavy sauce. add the the 4 egg whites, beaten, and about half a pint whipped cream and let it stand over night so it gets nice and fluffy.